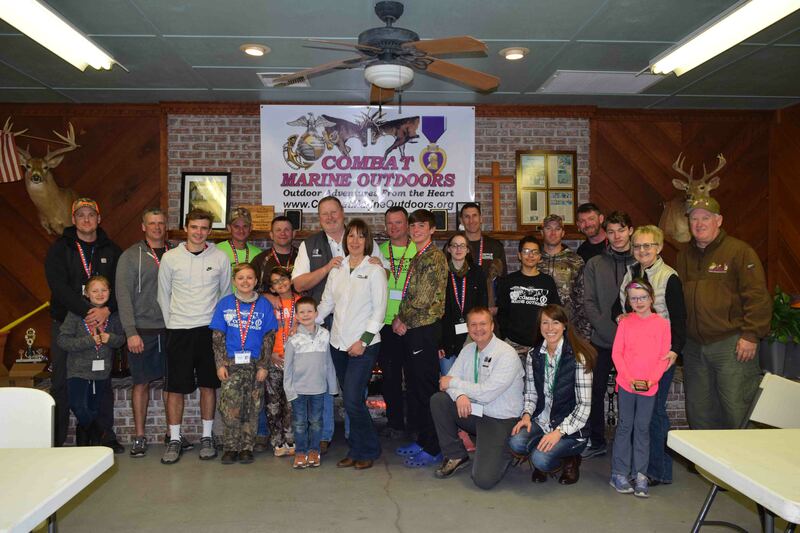 Gray Logging, LLC had the privilege of sponsoring a dinner for the Combat Marine Outdoors in March of this year. The event was catered by Goodman’s BBQ of Perry, FL. Combat Marine Outdoors is an organization that helps wounded soldiers. The mission of CMO is to provide Dream Hunts and Outdoor Adventures for severely wounded Marines, Soldiers, Airmen, Sailors and Navy Corpsmen. These hunting and fishing excursions play a vital role in the rehabilitation of these American heroes. The following day, the marines took a trip to a tract of timber that was being harvested by Gray Logging, LLC. The participants were able to see each piece of machinery, its corresponding job was explained, and then see each piece maneuver. Kids, as well as adults, were amazed by the gigantic equipment in operation. Afterwards, each child was given a packet containing wood/tree information, coloring sheets, a list of various goods made from and/or with the wood or wood by-products showing that “Wood Is Good”. Full tuition scholarships may be available; class begins Sept. 5. 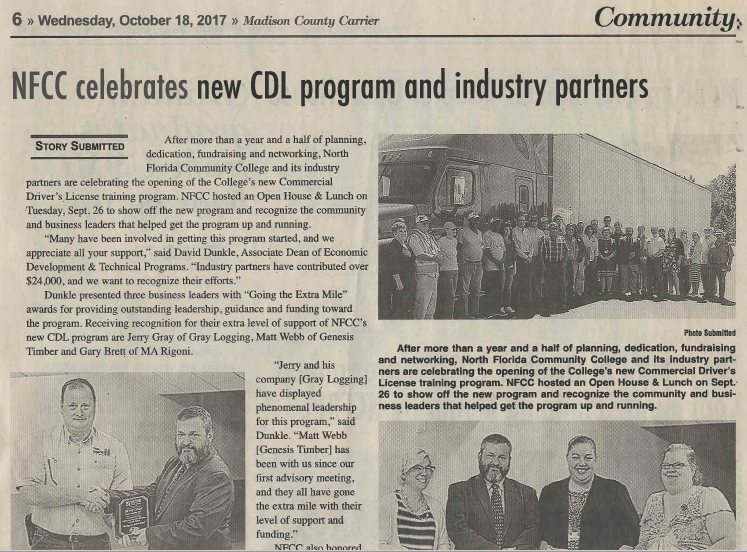 North Florida Community College and CareerSource North Florida are working together to bring a new Commercial Driver’s License-Class A certification program to the College. Regional companies, including Gray Logging, Genesis Timber, M.A. 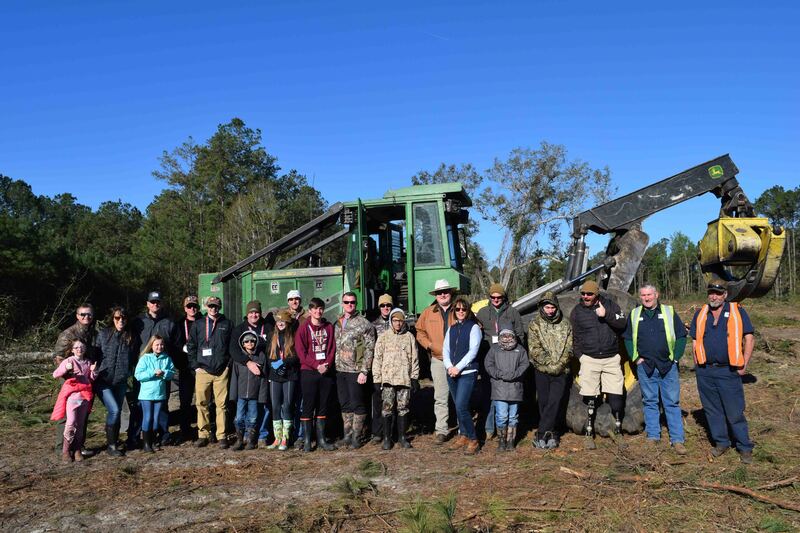 Rigoni, Suwannee Timber Management, Gilman Building Products, and Johnson & Johnson, have also helped NFCC shape the new program to meet local and regional workforce demands. Classes are set to begin Sept. 5. To be considered for the program, potential students must be at least 18-years-old and must attend an orientation session at NFCC to determine program and scholarship eligibility. The first 30 students to complete admission requirements and successfully enroll in the CDL program at NFCC may be eligible to have their tuition fully funded by CareerSource North Florida. Training will focus on basic driving skills; material handling equipment; basic maneuvers such as backing, docking and handling; and safety measures. Students will be taught to drive on various terrains, including city and country roads, and practice driving during both day and night time frames. Classes will be held at NFCC Monday-Thursday from 7:30 a.m. to 5:30 p.m. with hours varying to compensate for night driving requirements. Potential students are required to attend a one-hour NFCC CDL-Class A Orientation Session. 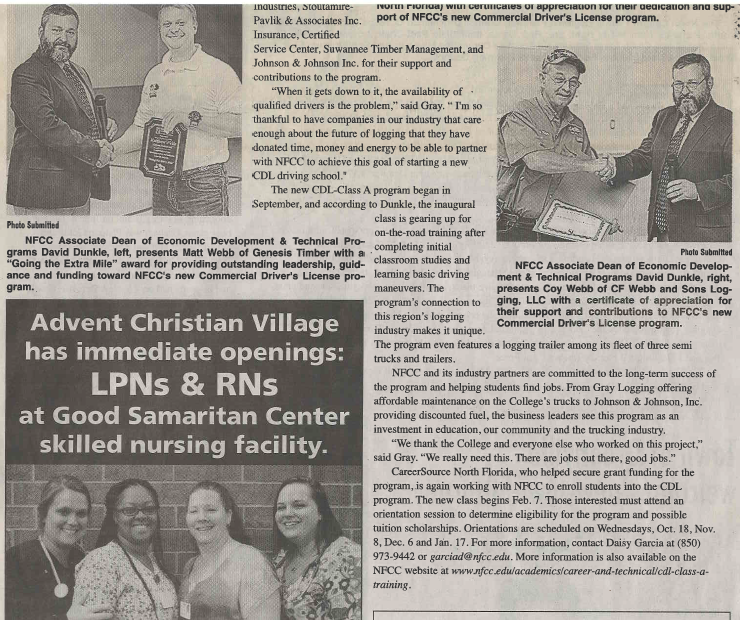 Orientation sessions will be held at the NFCC Career and Technical Education Center (Bldg. 13, RM 221) in Madison. For more details, contact Amy Webb at (850) 973-9675, ext. 112 or email CTStaff@CareerSourceNorthFlorida.com. 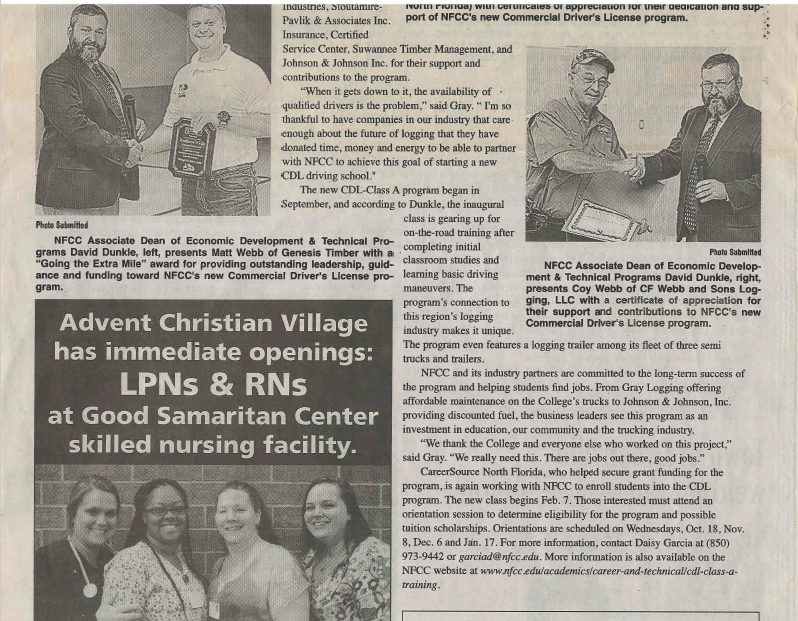 More information is available at www.nfcc.edu/academics/career-and-technical/cdl-class-a-training or by contacting the NFCC Career and Technical Education Center at (850) 973-9470. Let NFCC help you gain the knowledge and skills required to become a safe, successful member of the trucking industry. NFCC’s experienced instructors will share insights from the road and teach you valuable concepts and techniques you’ll need to earn your Commercial Driver’s License-Class A certification. Learn to drive on various terrains – city and country roads – and practice driving during both day and night time frames. Hours will vary to compensate for night driving requirements. Financial Aid: Tuition assistance may be available through CareerSource North Florida’s WIOA program to qualifying applicants. 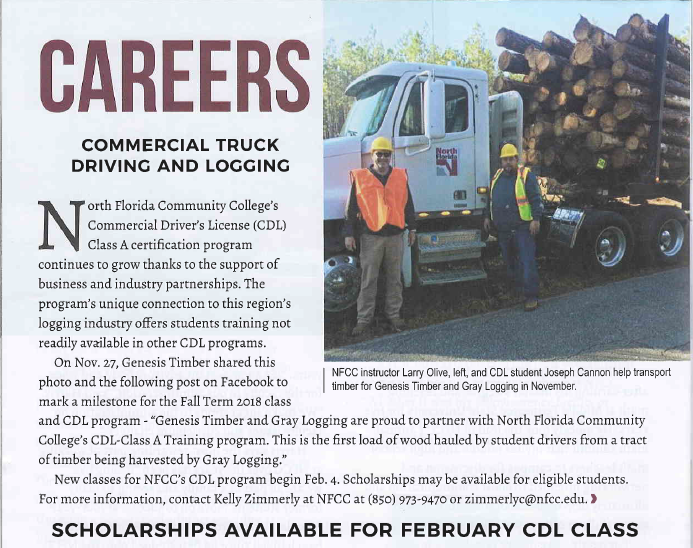 More Information: For CDL pre-requisites, contact Kelly Zimmerly at 850-973-9470 or via email at zimmerlyc@nfcc.edu. Available through Madison County Tax Collector Office or online at www.floridadrivingrecord.com. Submit an application for admission with payment of the $20 non-refundable fee to the North Florida Community College Office of Admissions. 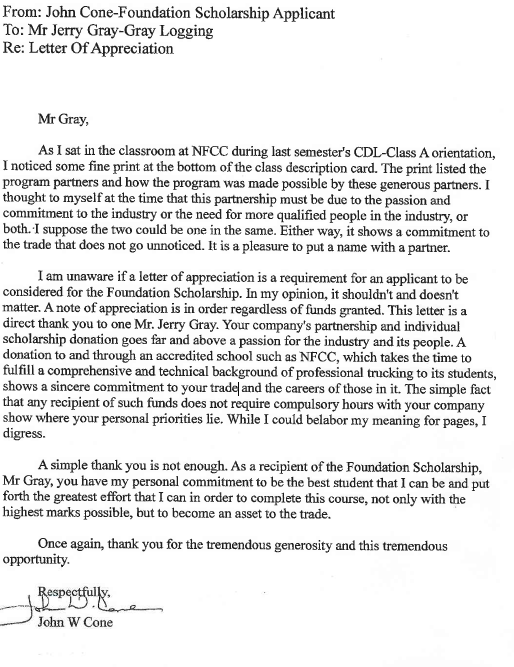 Partnerships: This career training program is made possible through funding and partnerships between NFCC, CareerSource North Florida, Gray Logging, Genesis Timber, M.A. Rigoni, TW Byrd Sons, CF Webb & Sons Logging, Suwannee Lumber Company, Packaging Corp of America, John A. Cruce, Jr Inc, Stoutamire-Pavlik & Associates Inc. Insurance, Certified Service Center, Suwannee Timber Management, and Johnson & Johnson Inc. Admission, program and degree requirements are subject to change. Contact the program coordinator or an NFCC academic advisor for the most current information. Jerry had truck driver, Freddy Stalnaker, drive and leave a loaded log truck for the presentation. 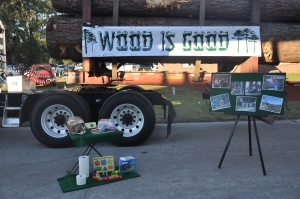 A table with items made from wood and/or wood products like cellulose were on display as well as a felt board with pictures of various logging jobs within Gray Logging, LLC. 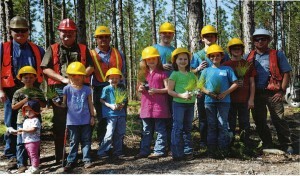 The Florida Forestry Association provided pencils to be given to each student at the end of the presentation. The weather was a bit chilly, but the students seemed to enjoy being outside to take part in the presentation. They asked interesting questions and left with a better understanding of the importance of wood materials in providing comfort and convinence in our everyday lives. One little boy exclaimed, “Now that’s what I’m gonna be – a logger!” And that’s what it was all about. 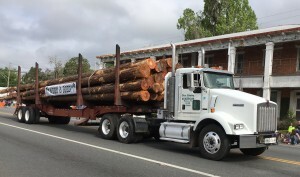 Being a “Local” business, Gray Logging, LLC entered a loaded log truck in the parade. The loaded wood held a banner that said, “Wood Is Good”. The hope was that local residents and visitors alike would receive the message that wood is a good and useful product and that log trucks haul this useful product for our benefit. Another message was that Gray Logging, LLC is a local business that employs local citizens and provides an economic value for the community. 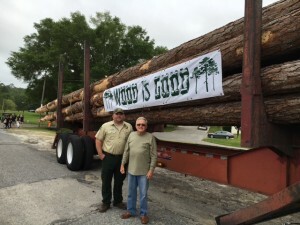 Besides being a local business in the parade, the wood that was loaded on the log truck was harvested from a tract of land belonging to local Madison county Tree Farmers, Bubba and Maria Greene. Bubba said, “I planted those trees in 1977 and it was on overnight success”! 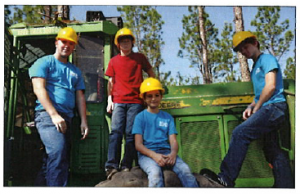 On Friday, May 1st, several members of the homeschool group from Madison County, REACH, took a field trip to the woods operation of Gray Logging, LLC. 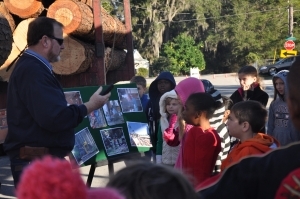 The students, along with their parents, met at Gray Logging, LLC’s shop and business headquarters. Jerry Gray, owner and operator of Gray Logging, LLC welcomed them. He discussed with the students the many things that are made from wood, how wood products are an important and beneficial part of our lives, and that “wood is good”. Hard hats were passed out to all. Next, the group was able to travel to the woods operation. Special thanks to the landowner, Mitchell L. McElroy, for allowing this field trip to take place on his property. The students were divided into two groups and the excitement and fun began. One group went with Todd Witt, local forester with Genesis Timber, LLC. He discussed various tree species, determining the age of a tree, and the renewability and sustainability of the forest. He bored a hole in a pine tree and pulled out the core for examination. The students were able to count the rings and determine the age of the tree, which was twenty-four years. Another group was under the direction of Joshua Light, Logging Operations and Tract Manager for Genesis Timber, LLC. He discussed the job of each piece of equipment used in the woods operation and each student was able to see and touch the equipment. The students were allowed to ride on the loader. Then, the groups switched. To end the day, Jerry Gray presented each student with a Longleaf Pine seedling to be planted at home. The seedlings were donated by Superior Trees, Inc. of Lee, Florida. Forester Todd Witt gave the instructions on planting and caring for the seedling which is native to our area. In, it was a fun learning experience.